This year marks the 30th anniversary of the closure of the B.R.E.L Works (Great Western Railway Works) in Swindon. 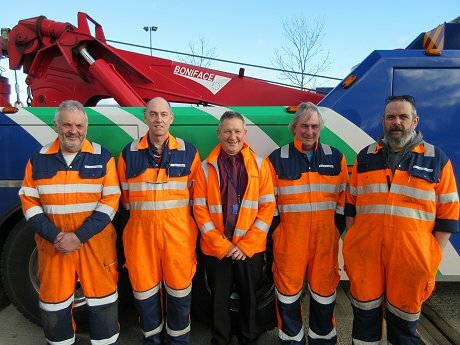 However the skills and expertise that the Works brought to the town still remains in daily use at Thamesdown Transport. With the closure in March 1986, there was a wealth of people looking for jobs in the town with specific skills honed during years of work rebuilding and refurbishing trains. Five of these found new roles at Thamesdown and thirty years later are still with the bus company. Former Coach Builders Nigel Peart and Adrian Curtis, former Coach Painter Paul Armstrong, former Coach Trimmer and Head Foreman Stan Scott and former Fitters Mate Trevor Savin have all spent the time in between putting the legacy of the Railway Works to good use at Thamesdown. Paul and Stan are even doing the same jobs at Thamesdown that they did at the Railway Works. When the Works closed, Thamesdown saw this as an opportunity to start their own coach trimming department and so the bus company employed Stan Scott who brought equipment from the Railway Works. Over the years much of this has been replaced, however Thamesdown still use the same work benches today. The skills and processes involved in trimming and coach painting today are the same as what was used when Swindon was still the centre of coachworks. Many of the buses are hand painted using brushes and the seats are cut and covered by hand. Nigel Peart, now Assistant Engineering Manager, first joined Thamesdown in 1975 to complete his apprenticeship as a Coach Builder before joining the B.R.E.L Works (Great Western Railway Works). When it closed 11 years later he returned to Thamesdown.